Over the years our Innovation in Pedagogy Cafés and Sustainability Education research seminars have covered a diversity of topics. Following is a summary of our events giving a flavour of that diversity. Dialogic approaches to facilitating student enquiry is a contested idea and a demanding practice as it requires active listening, criticality, collaboration and disagreement. This workshop, facilitated by Joanna Haynes and Paul Warwick, offered participants the opportunity to explore ways that educators can work with students to create open spaces for dialogue and enquiry to flourish with a particular focus on sustainability issues. Drawing from their practice and research, Joanna and Paul shared ideas on working with learners to establish favourable conditions and relations for dialogue. Participants were invited to join in an enquiry into dialogic pedagogies, drawing from each other’s experiences and ideas. This seminar focused on research into Higher Education for Sustainable Development. Based on the Routledge Handbook of Higher Education for Sustainable Development, key issues, trends and needs for future research were presented. The seminar considered the implementation of Higher Education for Sustainable Development at the University of Vechta (Germany) and its contribution to the development of students’ sustainability competencies. Marco Rieckmann is Assistant Professor of Higher Education Development at the University of Vechta, Germany. He is President of the Commission ‘Education for Sustainable Development’ of the German Educational Research Association (GERA), Representative of GERA in the Council of the European Educational Research Association (EERA), and Member of the Coordination Group of the EERA Network ‘Environmental and Sustainability Education Research‘. His major research and teaching interests are in higher education development, competence development and assessment, (higher) education for sustainable development, and global education. Educational outcomes related to sustainability increasingly include a range of competencies and attributes that are best developed through experiential and active learning opportunities. Using the city as a potential space for learning is one approach that can help us at Plymouth to meet this important educational challenge for our students. In this interactive café, Alun Morgan provided us with an excellent introduction to the field of place based learning, giving an overview of the recent research into this pedagogical approach and providing key points of insight for practitioners to discuss. Roz Birch then talked to us about the work of her CIC Growing Sustainable Futures and the recent launch of CLASP (Communities Learning About Sustainability in Plymouth) and the variety of opportunities that are emerging across the city for people to be experientially engaged with sustainability education. In keeping with the innovation in pedagogy café series this workshop enabled participants to creatively explore with the presenters how place based learning could be integrated into their teaching practice, over tea and biscuits. Dr Alun Morgan is a lecturer in education within the Institute of Education. He has a particular research interest in place based learning and transformative learning. Roz Birch is director of the Community Interest Company ‘Growing Sustainable Futures’. This pioneering organisation is dedicated to offering children, young people and organisations the opportunity to build a sustainable community together. Based in Plymouth Roz has also helped to set up the CLASP network bringing together different agencies and organisations from across the city to explore the range of doorways to sustainability education that we can offer to the community. 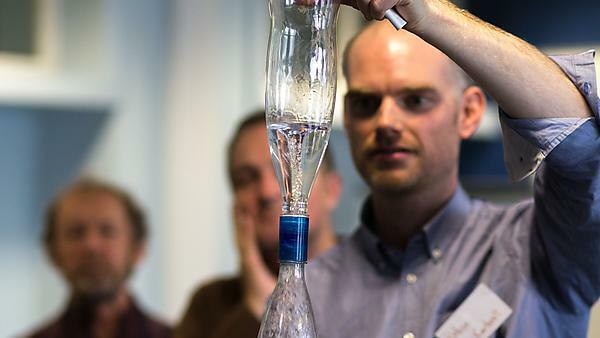 This workshop, facilitated by Paul Warwick and Lynne Wyness, offered an informal networking opportunity for all interested in sustainability teaching and learning. A particular focus for this café was the recently developed graduate attributes framework - the University of Plymouth Compass - for students at the University of Plymouth and the strong links this has to the Sustainability agenda. It is incredibly clear that both the University and UPSU are truly committed to embedding education for sustainable development within their core functions, which is enriching the experiences of students across the University. The University of Plymouth, in partnership with UPSU, receives Responsible Futures Award from the NUS for the quality of its sustainability education. We were delighted to welcome Dr Ian Cook, Associate Professor in Geography, from the University of Exeter, who along with two of his undergraduate students from his Geographies of Material Culture module, led an interactive session based on his innovative teaching work uncovering the hidden stories behind our everyday shopping. Have a look at his website Follow the Things where his students showcase their research. Following Ian, Helen Bowstead (English Language Centre, University of Plymouth) demonstrated how encouraging students to engage with sustainability issues relating to the products they use every day can help 're-balance' power relations within cohorts, which may include students with diverse educational and cultural backgrounds and a range of English language skills. Global consensus is a dream, but Twitter is real: Replicating the United Nations global agreement process through classroom politics and negotiation by social media. This workshop was co-led by Simon Kemp and Julia Kendal from the University of Southampton and involved a shortened version of the successful ‘Sustainable Development Goals (SDGs) Summit’ from the university-wide ‘Sustainability’ module at the University of Southampton. It demonstrated how to run a mock ‘United Nations’ global summit as a vehicle for teaching students the complexities that surround international political negotiation in the field of sustainable development. Delegates represented selected international ‘blocs’ and attempted to reach consensus on global political goals through personal and social media negotiation as an alternative mechanism of addressing Education for Sustainable Development (ESD). The workshop focused on the delivery of innovative teaching sessions that involve traditional political negotiation, blended with the use of social media via Twitter. Student feedback at Southampton has been overwhelmingly enthusiastic about the pedagogical experience and the learning outcomes gained from this exercise. Dr Lynne Wyness (CSF, University of Plymouth) examined what good practice might look like for students (and community members) learning through community engagement and offered some lessons learnt from her experiences of conducting a small intergenerational, social learning project around the concept of sustainability-focused citizenship, with students and members of an East Devon community association. Professor Janet Richardson (Professor of Health Service Research, University of Plymouth) and Dr Jane Grose (Research Fellow Sustainability and Health, University of Plymouth) led an interactive session based on their innovative teaching work that helps nursing students to realise the global connections and sustainability implications behind their everyday 'work spaces'. The workshop provided the opportunity to have a hands-on experience of a pedagogy that is specifically designed to encourage students to develop their critical and systems thinking skills. Dr Rory Shand (School of Governance, University of Plymouth) presented his thoughts around 'Connecting research, impact and pedagogy: sustainability, governance and urban renewal'. This session explored his experience in connecting research, practice and pedagogy through the design of community governance systems in sustainability and urban renewal, and sought to discuss the uses and limits of models for community governance in urban renewal and sustainability, and how these might enable greater integration of research, impact and pedagogy. Professor Kerry Shephard from the University of Otago, in New Zealand, presented the final café of 2014. Educational outcomes related to sustainability often include affective attributes such as values, attitudes and behaviours, widely recognised as difficult to research, monitor, assess, evaluate or otherwise measure. In this Innovation in Pedagogy Café, Kerry interpreted sustainability-learning within a framework of affect and described possible and appropriate ways to ‘measure’ learning in the affective domain. As a group, we discussed other descriptions of learning, such as competencies, higher-order cognitive abilities and conation; made comparisons with values-learning in other disciplines; identified which forms of learning are open to assessment in individuals and which are best evaluated in cohorts; and explored whether, or not, the generally-accepted objectives of ESD are the most appropriate for higher education to seek. Kerry completed his PhD in the UK, before moving to Dunedin in 1979 to undertake post-doctoral research in the Zoology Department. He returned to the UK in 1981 to take up a lectureship at the University of Buckingham where he developed an interest in research-led teaching alongside his research into animal osmoregulation. Kerry became Learning Technologies Coordinator in the University of Southampton's Centre for Learning and Teaching in 2000 and returned to New Zealand in 2006. He is now Professor of Higher Education Development in HEDC in the University of Otago, New Zealand. In this inaugural café, Dr Paul Warwick (CSF, University of Plymouth) shared resources from his work in engaging students with controversial issues through Earth Summit Simulations and an Open Space for Dialogue and Enquiry methodology. Dr Robbie Guevara (Associate Professor in International Development, RMIT, Melbourne) presented his ideas and experience of education for sustainable development in a context of climate change, entitled Rethinking Learning for Resilience. Dr Rob Hales (Lecturer in Department of Tourism, Sport and Hotel Management, Griffith University, Brisbane) reflected on a recent sustainability subject he taught where he included movie making and web design as a method of learning and assessment for the course’s major project. Visual representation of learning as measured through assessment has received limited attention in the education for sustainable development literature and so support to improve course pedagogy has been sourced from general literature on visual methods. He discussed the implications for student learning that result from engaging with complex system issues of sustainability through visual representation of learning and how this can be facilitated and evaluated by assessment. Antony Turner (Carbon Visuals) and Dr Helen Lawson (CSF, University of Plymouth ) shared the work of Carbon Visuals and the project that has been developed at the University to engage students visually with the carbon footprint of the campus. Antony introduced their new resource Pictures of Success, an innovative sustainability process with a track-record of inspiring and educating students through engagement with real picture-based stories. Two copies of this resource are available in CSF Kirkby Lodge for loan. Sustainability education research continues to highlight the importance of learning spaces that facilitate dialogue, collaboration and critical reflection. In this café, Helen Bowstead and Christie Pritchard (Learning Development) introduced us to the vision behind a new space on campus - The Writing Café - that was purposefully designed with these learning activities in mind. 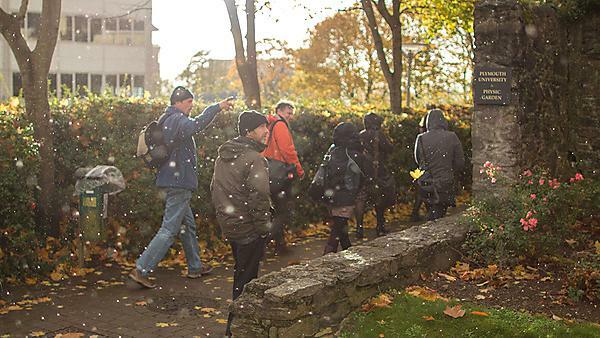 The group then headed off into the autumnal rain to take a learning journey looking at how outdoor spaces on campus are being developed by staff and students to provide experiential sustainability education opportunities. We saw how the Plymouth Growing Futures project is increasing the food grown and biodiversity of our green spaces on campus, whilst a different perspective was offered on the ‘international university’ by revealing how the trees and plants on campus are already 'consummate internationalists and no respecters of human concepts of borders and boundaries'. The café started with a short input from Professor Stephen Sterling who introduced his Linking Thinking resource (endorsed by UNESCO chair Chuck Hopkins as 'the best presentation on systems thinking I've ever seen'). Robin de Carteret then led us through experiential activities that modelled the complex dynamics in organisms, ecosystems, economy and society. We explored concepts such as feedback, emergence, tipping points, edge of chaos and self-regulation, and the games were interspersed with inspiring images and film clips of natural systems exhibiting similar complex emergent behaviour. Robin talked us through the shift from a 'mechanistic' to a 'living systems' view of the world - one where we move from a paradigm of control to one of participation.